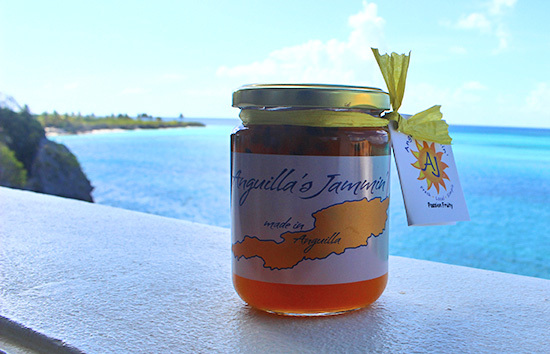 Anguilla's first island-made jam is here... Anguilla's Jammin'! It was a day in 2014 when Molly and Tommy had seen one snowflake too many. Originally from upstate New York, working in human resources and in the automotive industry, they fell in love with the idea of living in Anguilla. Molly had been a long-term visitor to Anguilla, thanks to her aunt, Jackie Cestero of Nature Explorers Anguilla. Since the '90s, Molly had been visiting Jackie in Tranquility Wrapped in Blue. It was on Tommy's first trip to Anguilla in 2014 when the husband and wife team were convinced. This is home. "The question was, how do we look out at this," Tommy said while gesturing to Shoal Bay's vast horizon and smooth, blue seas, "every single day?" The dream became a reality in early 2015. They left NY and planted new roots on their island home, Anguilla. A natural complement to Jackie's Nature Explorers Anguilla, with Molly and Tommy's interest in organic farming, and with a passion for cooking, Anguilla's Jammin' was born. What sets Anguilla's Jammin' apart in a big way? Their approach to sourcing ingredients. 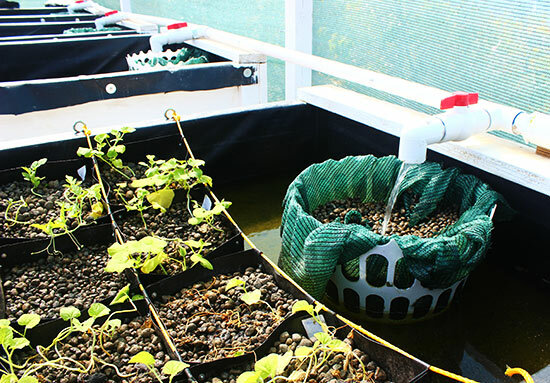 "We are growing everything from melons and strawberries to kiwis and peppers with aquaponics," Tommy started as he showed us their nursery overlooking Shoal Bay East. "It's an all-enclosed system with no waste and aquaponics only uses 10% of the water that normal farming methods demand." "It all starts with the fish who live in this 1500 gallon tank. The fish produce waste in the form of ammonia, which is cycled through to the plants' water source, providing the plants with natural nutrients," he continued. "The water then gets flushed into the plants' beds. I'm putting the finishing touches on a pump, a sort of breathing machine that cycles the water through the beds before ultimately ending up back in the fish tank." 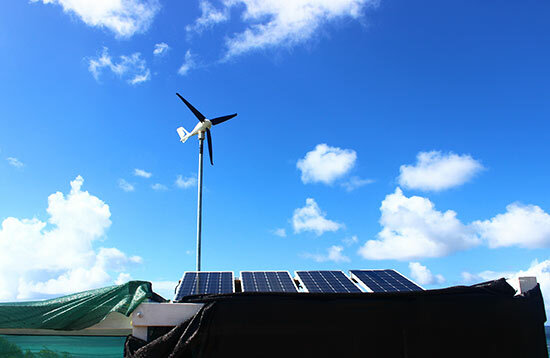 The whole mechanism is powered naturally by solar panels and a wind turbine that sits on the top of the semi-enclosed nursery. Shading above the system (the system holds 3000 gallons of water total) keeps evaporation low. Cost-effective, energy-efficient, organic and sustainable. No pesticides, no chemicals in contrast to hydroponics. The ability to farm year-round. You believe Tommy when he says, "Aquaponics is the way of the future." Their system is nothing short of exceptional and Tommy and Molly's mastery of aquaponics is impressive. Amazed by their accomplishments, the next question was, "Are you sure you don't have backgrounds in green housing and farming?" They looked at each other, laughed, and paused, "Nope, we don't!" 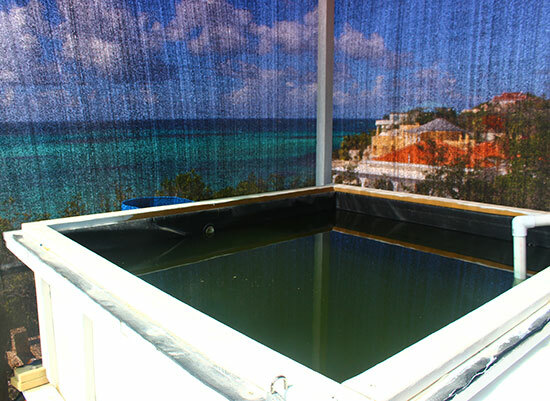 With zero previous knowledge, but armed with an interest to learn, bring something new to Anguilla and build a business in a cost-friendly and eco-friendly way, Molly and Tommy have both re-invented themselves and introduced a high potential farming method to Anguilla, a desert island with predominantly arid land. 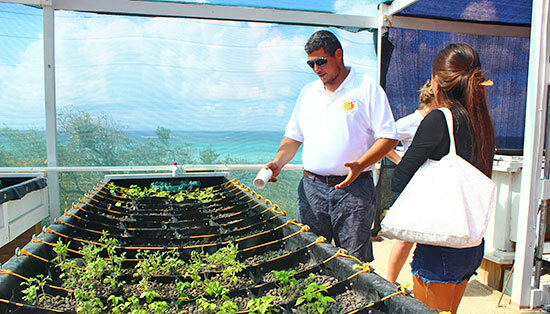 Future plans include tours of their facility and to re-create the aquaponics system with farmers throughout the island. The ultimate test lay ahead... the taste test. An extra-sweet way to sample jams! While we sampled each jam, Molly explained the process of creating the jams. 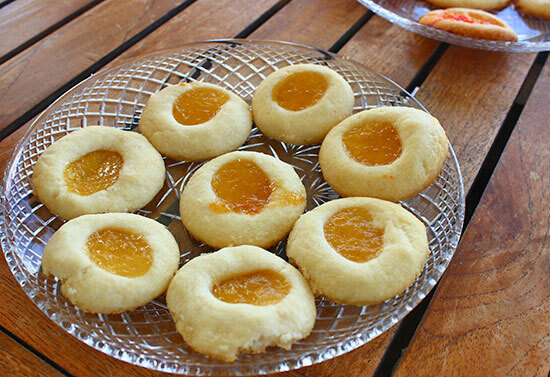 "Finding the right balance of pectin is key. We've tested quite a few, searching for that "just right" consistency. We started with a French pectin, which was too watery, then moved onto an American brand, which has been working well, and we recently discovered that by grinding down the peels of passion fruit, we can make pectin 100% organically on-island, too," she exclaimed. Talk about a no-waste product! After sampling the mango, melon, kiwi and passion fruit, it was time to move onto the "Hot Jamn." Over cream cheese, and served with Triscuits, we approached the first bite cautiously. Would it be too spicy? The taste on cream cheese too strange? The reaction? An absolute standout! The sweet, savory and spicy flavors complement each other perfectly. 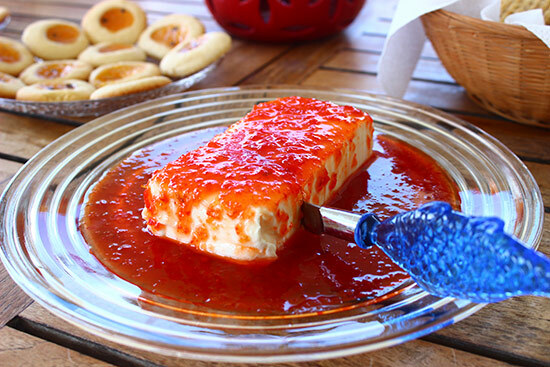 Vibrant and brightly colored, this is exactly how tropical jams should look and taste! Each jam lets the fruit's natural essence shine, our #1 favorite being the Hot Jamn and other favorites being the Passion Fruity, rich in taste, and the Kool Kiwi, which has a tangy kick. 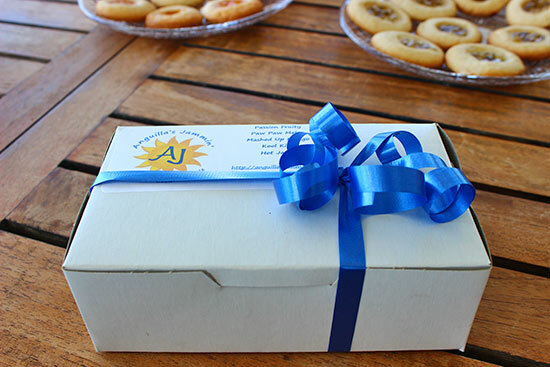 From a morning bite, spread over rustic country bread or a-top a fresh-baked croissant, and with a coffee, to a late afternoon snack with tortilla chips and cheese, and with a glass of wine, Anguilla Jammin' can happen all day long, even when you're hundreds of miles away from Anguilla. Finally, the packaging deserves a special mention. You know a product has been crafted with care and thought when even the packaging is almost too pretty to touch. Available in two sizes (mini jars (1 oz. - $3 USD) and large jars (8 oz - $12.50 USD)), each jam jar sports a tag with the name of the jam and a fact about Anguilla inscribed inside. The larger jars' tags feature beautiful photography and interesting information about Anguilla's national sport, boat racing. 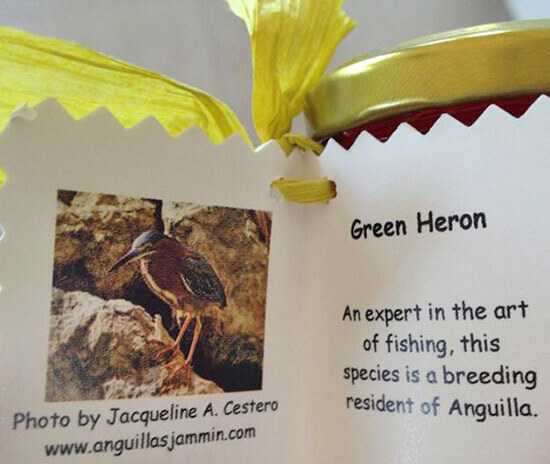 The mini jars focus on Jackie's calling, Anguilla's bird wildlife, with a different species highlighted on each tag. From start to finish, their attention to detail is apparent. An inspirational lesson in changing your life, building a business, and giving back, Jackie, Molly and Tommy are on to something remarkable. 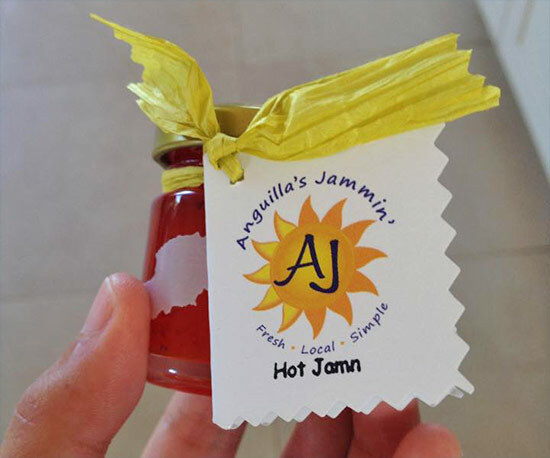 Where Can You Purchase Anguilla's Jammin'?